The boy, who was three, went up to the girl, looked her in the eye, and asked, "Are you OK? Can I get you a wet towel?" She wiped her tears, shook her head no, and they both went back to playing. I looked at the preschool director, like, uh, what was that? "We don't make kids say 'sorry'," she explained. "The word doesn't mean much without an action to help make things better." The exchange was such a departure from what I was used to seeing among parents, who tend to force apologies from their children for every accidental bump, whack, and knock-down of a just-built LEGO masterpiece. Usually, they will give the kid a stern look, and ask, "Hey, what do you say?" Then, when the child mutters a robotic "sorry", all is good! Manners! We're teaching them! But this approach might be mostly meaningless, writes Heather Shumaker in her book It's OK Not to Share and Other Renegade Rules for Raising Competent and Compassionate Kids. Children love the word "sorry", Shumaker explains, as it magically lets them off the hook. "It's a little like teaching kids to be hit-and-run drivers," she writes. The problem with the "sorry" solution is that many young children — say, preschool age — haven't reached a stage of moral development to actually feel sorry, so parents are missing a key opportunity to teach real empathy. Young kids sometimes fool us. They can mimic "Sorry" and even cry when another child cries, but most children are not capable of being sorry yet. Children differ — you may have an early bloomer — but most children simply lack the emotional and cognitive development to feel remorse. Remorse requires the ability to take another person's perspective and fully understand cause and effect. These skills are still emerging in young children. Expecting young kids to say "Sorry" teaches them nothing more than a misguided lesson in sequence: kick, say "Sorry," move on. Instead, parents can help kids develop moral compassion by explaining that their actions have consequences, showing that they can do something to make things better, and modelling ways to use the word "sorry" meaningfully. Sometimes, when children believe they're about to be in trouble, they run, Shumaker explains. If this happens, you can put an arm around the child, and say something like, "You need to come back here. Callie got hurt. Even if you didn't mean to do it, she got hurt, and you need to come back." Even when what happened seems obvious, it needs to be pointed out to a young child. State the facts. "Your shopping cart ran over her toe." "Your hand knocked the cup of water onto her painting." "You were dancing and your arm whacked her face." Examining the facts of the scene helps kids develop empathy. Emphasise the consequences of their actions for the other child (or adult), and be specific: "Look, he's crying. There's a scratch on his arm. It must hurt." Ask the child: "Are you OK?" While little kids may not fully understand remorse, the book explains, they are good at taking action. They can run to grab a Band-Aid or an ice pack, or help clean up the mess they made. Help them take responsibility. Shumaker writes, "Reassurance that it won't happen again means something. 'Sorry' does not." To reestablish trust among the kids, she writes, have the child who caused the accident make a guarantee to the other child that she won't do it again. You can ask, "Are you going to hit him again?" or have her say the words, "I won't hit you again." Eventually, we do want kids to say "sorry". But instead of making them say "sorry", Shumaker writes that it's more effective to model saying sorry when you as a parent screw up. Just make sure your own apologies are meaningful. That means acknowledging the consequences of your actions and taking steps to make things better. For example: "I'm sorry I forgot to bring your teddy bear to school day. You missed him during nap time. I'm writing it down on my list so I will remember next time." 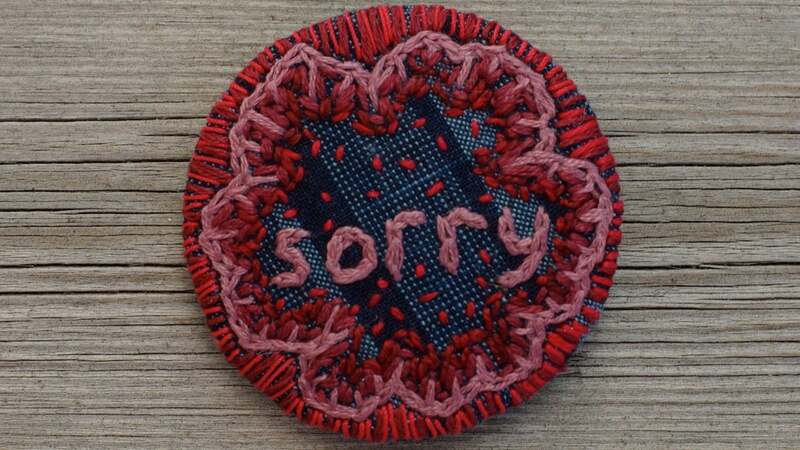 Soon, kids will say "sorry" without prompting, and they will really mean it. Clyff - if you don't want to look like a fool, don't comment on things you know nothing about. We see it with celebrities and politicians who are advised to say sorry very quickly. It usually appears quite insincere but nevertheless works to some extent because without it the followup story is he/she didn't even apologise. Whilst it would be better to see some action instead, so some choose to run off to a rehab facilty for all manner of sins, to demonstrate action. It usually takes a little time to demonstrate that you are sorry by not repeating the 'sin' or offering some remediation (which may or may not happen - hence its misuse), in the interim a sorry is sort of a promise that either/both will eventuate, but for now all that one can think to offer is a sorry, be it genuine or not. The story however is about children learning.